you may not back down. He is rather a story teller of short stories or situations that include characters of Buenos Aires, some times in a romantic mood, and in others, an eclectic one. He did not achieve an outstanding success because of his lyrics but it was rather due to the music that contained them and because of the great orchestras that included his numbers in their songbooks. On their last recording session together, D’Arienzo forewarns Biagi with the voice of Alberto Echagüe “Think it over, as there will be no return”. The music is composed by a member of D’Arienzo orquesta known for as much as one more tango. The lyrics for both of them was written by the same poet. Only one more month later, Biagi fully forms his own orquesta, and on the first recording session replies with “Golgotha”, his own, freshly written tango where he begs to allow him to carry his own cross. These were the facts. The only conclusion that I can possibly draw from them is that Rodolfo Biagi was longing for his own orquesta for quite a while before June 1938. And, this way or another, Juan D’Arienzo himself, as well as some of his friends and orquesta members, knew about it. The break up was a painful ordeal for both and did not happen overnight. 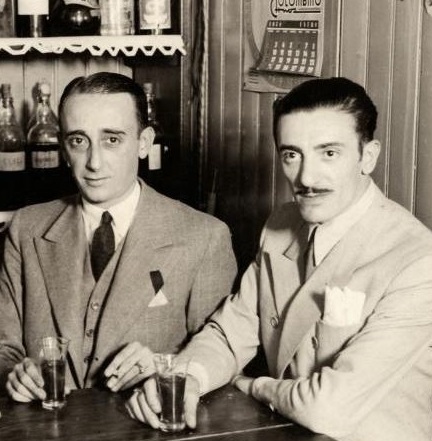 As for the incident with “Lágrimas y sonrisas” quoted in the beginning, even if it actually happened, it was a consequence of Biagi desire to take his own path, not at all the cause of the split between the two pioneers of the Golden Age. Keep posting these tango stories – I found them very interesting and helps me understand a bit more the music that I dance to. Thanks!